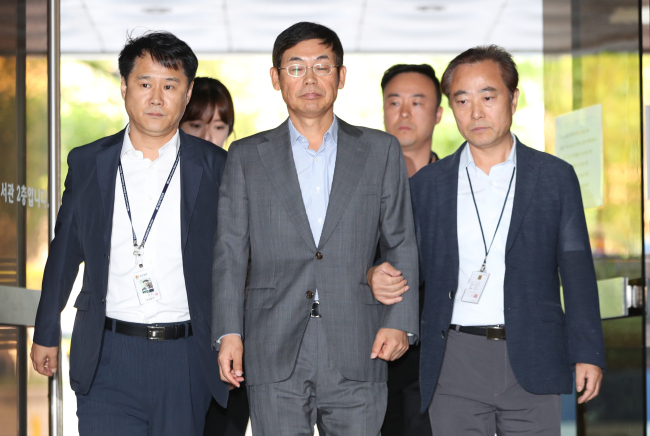 The Seoul Central District Court arraigned the chairman of Samsung Electronics Co.'s board of directors on Tuesday to determine whether to issue an arrest warrant for him on charges of hampering labor union activities at its after-sales services unit. Prosecutors sought the arrest warrant for Lee Sang-hoon last Friday on charges of violating labor and trade union laws. Lee, 63, is accused of engaging in a scheme to sabotage labor union efforts by Samsung Electronics Service employees in 2013. He was the head of the tech firm's management division when the labor union was being set up. On his arrival at the court, Lee didn't answer questions from reporters.